Produktinformationen ( Specification ) "Killer Wireless AC 1535 | Bluetooth 4.2 | M.2 2230"
Killer™ Wireless-AC high-performance networking adapters are redefining the wireless networking experience by delivering stunning speed, increased intelligence, and amazing control. The Killer Wireless-AC 1535 is the second generation of Killer Wireless-AC and introduces ExtremeRange™ technology that offers two external 5GHz signal amplifiers plus it supports 802.11ac Wave 2 features including support for MU-MIMO and Transmit Beamforming. With this cutting edge new technology, the Killer™ Wireless-AC 1535 improves latency, reduces jitter, and virtually eliminates video freezes at even greater ranges and with stronger signals than competing wireless adapters. Killer™ Wireless-AC adapters supports dual bands (2.4 GHz and 5GHz), IEEE standards-based 802.11a/b/g/n/ac, and Bluetooth connectivity. 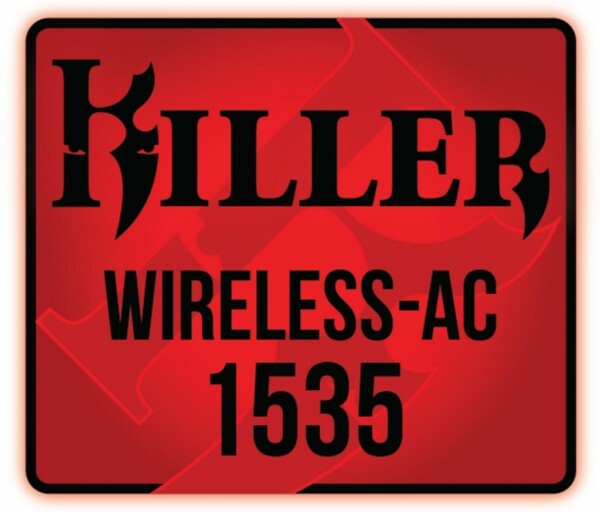 Killer™ Wireless-AC 1535 delivers industry-leading data rates up to 867 Mbps with range-enhancing 802.11ac technologies to deliver higher data throughput over longer distances. The Killer™ Wireless-AC 1535 with ExtremeRange™ Technology provides amazing speed, excellent throughput, and low latency for an incredible experience when playing online games, streaming your game, and enjoying HD video. Advanced Stream Detect 2.0 Technology – Advanced Stream Detect Technology detects applications and websites, and prioritizes their traffic accordingly for the best speed and optimal performance. ExtremeRange™ Technology: In addition to supporting dual-band (2.4 GHz and 5 GHz) and IEEE standards-based 802.11a/b/g/n/ac, Killer Wireless-AC 1535 introduces full MU-MIMO and Transmit Beamforming support plus 2 external 5GHz signal amplifiers. This allows Killer to offer an unparalleled and uninterrupted experience at longer ranges from your access point. DoubleShot Pro – Killer’s DoubleShot Pro Technology which allows you to use WiFi and Ethernet at the same time – even on different networks. Killer gives you the power to choose which apps go over Ethernet and which go over Wireless. Killer Control Center – Killer delivers you amazing networking control and information with the Killer Control Center. Gamers and PC users now have the power to control and configure your PC networking like never before. 11ac 2X2 WLAN standards with low power PCIe (with L1 sub-state) interfaces + BT 4.2 with USB1.1 interface. Support Bluetooth 4.2 + HS, BLE, ANT+ and is backwards compatible with Bluetooth 1.2, 2.X + enhanced data rate. Weiterführende Links zu "Killer Wireless AC 1535 | Bluetooth 4.2 | M.2 2230"
Kundenbewertungen für "Killer Wireless AC 1535 | Bluetooth 4.2 | M.2 2230"